I am slightly obsessed with my weight. Forgive me: I am 58 and have spent many decades repeatedly putting on weight slowly, and then losing it rapidly. My recent discovery of the Mifflin St Joer equations (link) has allowed me to simulate my weight over time, and my calculations are allowing me to understanding my own experience. Is homeostasis of weight even possible? Homeostasis (or Homoeostasis) is the term given to physiological systems which conspire to keep something constant. For example, we have systems that maintain our body temperature without any conscious effort. I don’t have to berate myself for being too hot and promise myself that in the future I will try to be cooler. No. Our bodies sort out their internal temperature. I understand the system consists of temperature sensitive cells and nervous system reflexes that control blood flow, sweat glands, shiver reflexes, and our desire to undertake activity. And I have generally imagined that in a more perfect world, a similar kind of system would underpin my desire to eat. In this ideal world, I would naturally maintain my weight without any obvious effort on my part – stopping eating when I had eaten ‘enough’. I had thought such a system actually existed. One part of the system is supposed to arise from the competing actions of hormones such as ghrelin – which makes us experience hunger – and leptin – which makes us feel satiated. Together, ghrelin and leptin are supposed to act as part of a system of energy homeostasis. 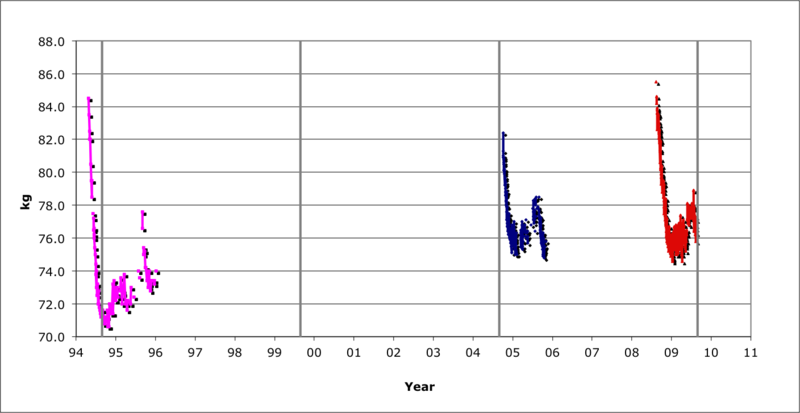 However, having run many simulations of my own weight versus time (see below) and reflected on this, I am sceptical. We all know people who seem to be able to eat at their ease and not put on weight. I have no explanation for that, but then I have never experienced that myself. I programmed the Mifflin St Joer equations into a spreadsheet to see the predicted effect on my weight of various dietary and exercise choices. You can download the spreadsheet here and perform calculations about yourself in the privacy of your own computer. I entered my current age (58.2 years) and weight (74 kg), and I used the MSJ equations to predict what would happen to my weight if I ate 1800 kiloCalories (kCal) a day. The red line suggests that if I eat 1800 kCal/day then my weight will gradually decline over the next couple of years stabilising at about 71 kg. That would be dandy. However, the dotted green lines show what would happen if I got my calorific intake wrong by ± 50 kCal per day. This is plus or minus half of a small glass of wine, or a half a biscuit either eaten, or not eaten. These ‘alternate realities’ predict that my weight in three years time might be anywhere between 64 kg and 77 kg – a range of 13 kg! To be within a kilogram of the predicted weight, my average energy intake would need to match 1800 kCal/day within 10 kCal a day. That is less than a single mouthful of food! I don’t believe that any autonomic system can achieve that level of control. Reflecting on these simulations, I don’t believe that the systems within our bodies that mediate ‘energy homoeostasis’ operate well over many years. At least they don’t operate well in an environment where calories are so easy to obtain. So I think my experience of slow weight gain over time is not a fault with my autonomic nervous system, or a moral failing on my part. It is just the way things are. Asking several slim individuals around the coffee machine this morning confirmed my view. They all were either (a) young (b) self-conscious about fitting into clothes or (c) weighed themselves regularly. Personally I have resolved to keep weighing myself and using this to provide manual feedback. How is my weight doing? Thank you for asking. It’s been just about stable since Christmas and I intend to keep it that way! My Weight: Good News or Bad News? I spent most of 2017 feeling bad about my weight. But as I review the data now I realise I can say positive things about my weight which – if I could believe my own words – would leaving me feeling good about my weight. Alternatively, I could say negative things which would leave me feeling bad about my weight. In either case the data would be the same. So which view should I take? The graph below shows my weight determined first thing in the morning for almost every day throughout the last two years. But then, as work became a nightmare, my weight drifted back up at just 10 g per day – a weight gain equivalent to a biscuit or a glass of wine per day. By the end of the year I managed to catch my breath enough to slowly lose some weight. And that is pretty much where I am at now. So how should I feel about this data? What story should I tell myself? “Well done! You managed to keep control of your weight through a difficult year. And your weight is only 1 kg more than it was at the start of 2017. And still 13 kg lower than it was at the start of 2016”? “What a mess! You put on 3 kg through the year! In either case, the data are the same. So actually I think I will just keep the graphs and refrain from telling myself any story at all. Indeed, the real storyline won’t become clear until I find out what happens next. 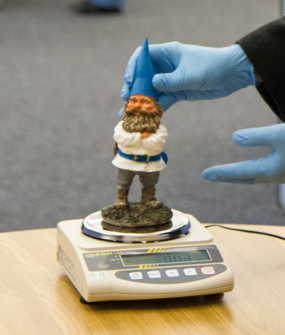 Weighing a gnome is actually a way of probing the gravity field around us. Gravity is the most mysterious of the forces we experience in our lives. Impossible to screen against, it extends throughout space to the farthest corners (corners?) of the cosmos, causing every piece of matter in the Universe to affect every other. Wow! More prosaically, gravity gives rise to the phenomenon of ‘weight’ – the force which pulls us ‘down’ to the Earth. GCSE students are tutored on the difference between mass and weight, and are told that the weight of an object, say a Gnome, varies from one planet to another, but its mass is the same on any planet. However, the Kern instrument company are keen to point out that if you use a sensitive force balance, its weight changes from place to place around the Earth. The balance doesn’t even need to be that sensitive. I was surprised to find out by how much the weight of an object measured at a fixed height above sea level changes with latitude and longitude: – it varies by around 0.5%. So for a Gnome weighing around 300 g, changes of 1.5 g should be seen and this is easily detectable. The rationale for the publicity stunt is explained here, and you can follow the Kern Gnome on his journey here. I like this experiment because the measurement is so simple – and yet the physics it uncovers is so profound. The light-hearted video below shows my children’s reflections on the mystery of Gravity. P.S. After a period of steady decline, my own weight has been mysteriously increasing. I think this may be due to a fluctuation in the gravitational constant G. More about this in future articles. My weight having tipped 86 kg, (BMI 28) and my belly having inched past the limits of 34″ waist trousers, I have begun a diet. Again. The first couple of weeks have been fine with my weight falling by roughly 1 kilogram a week (my target is 0.1 kilograms per day). Plotting my weight on a spreadsheet I see that this is my fourth diet in 16 years and with each diet I seem to go over the same weight range. And at the end of each diet I am eating happily, I feel much better, my BMI is back to 25, and I can’t think of any reason why that should change. But it does. Somehow – all that weight creeps back on. Between 2006 and 2009 (≈1000 days) I put on roughly 10 kilograms – or about 10 grams per day – equivalent to an calorific imbalance of around 85 ± 15 calories per day. This is a single biscuit a day – or the difference between a slice of buttered bread or non-buttered bread. Is this my fate? Am I condemned to an anti–Sisyphean cycle: endlessly pushing my weight down the hill only to have it roll back up? Oh! the Gods are cruel! The talk above is by Giulio Tononi, of the University of Wisconsin on “Sleep function and synaptic homeostasis” – stop yawning at the back! Its about 20 minutes long and is comprehensible for around the first 5 minutes. I have been dieting lately, restricting my calorie intake to somewhere around 1500 calories* per day. I am using the H-plan® diet – where the H stands for hunger: basically the idea is to avoid panic when I feel hungry and just get used to the feeling. Well I am losing weight (of which more later), but the diet has had a side-effect: I don’t need as much sleep. I know that after eating a big meal I would feel especially sleepy, and I wonder if this is just a re-bound from having previously eaten too many large meals? Normally I sleep for just under 8 hours but crave for more. Currently I am sleeping for 7 and waking refreshed. I have looked on-line for explanations, or corroboration that this is a genuine effect and found nothing. Why I should feel the need for corroboration of something I am experiencing is something else I don’t understand! But even though it appears to be just me, it certainly lifts my mood. With my current surfeit of wakefulness, I came across a discussion on Quora about sleep, linked to a talk on YouTube (see top of the page) addressing the fundamental question: What is sleep for? Hearing the basic facts of sleep read out (about 1 minute into the talk) it seemed amazing that we don’t have an answer to the question. Sleep is central to our lives – both personally and as part of of our symbiotic relationship with our spinning planet – and essential to our health. And yet we not know the answer to something so basic as ‘What is it for?’. Wow. I was reminded of the role of the Sun in our lives. Our lives and cultures are based around the action of sunlight on the Earth, and yet we never look at the Sun directly – it would damage us if we did so. Similarly with sleep, because we lose consciousness during sleep – it evades our gaze. *1 calorie is a dietary unit of energy approximately equal to 4200 joules.